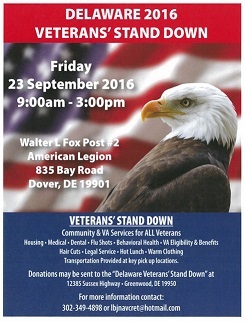 I am honored to be a part of the dental teams serving the 2017 Delaware Veterans' Stand Down. When: Friday, September 22, 2017, 9am - 2pm. Where: Schutte Park Recreation Center, 10 Electric Avenue, Dover, DE 19904. During this event, organized by the Delaware State Dental Society, volunteer dentists and their teams provided basic dental education, and performed screenings of in-need veterans to assess their dental needs. Other services were also available, including housing, medical, flu shots, behavioral health, VA eligibility and benefits, legal services, hair cuts, warm clothing and a hot lunch. We are pleased and proud to serve a large and appreciative crowd of veterans during this annual event. Thank you all for your service.